WASHINGTON — Plans to toll single drivers traveling on Interstate 66 inside the Capital Beltway during the rush hour moved much closer to reality Tuesday with the award of two major contracts, including one that was far higher than what the Virginia Department of Transportation had estimated. The construction contract awarded by the Commonwealth Transportation Board for new electronic toll gantries and signs came in at $33.7 million, nearly twice the $17.5 million projection from VDOT. “We basically missed it, we blew the estimate,” Virginia Transportation Secretary Aubrey Layne said. Tolls are expected to cover the cost of construction. However Layne said the more expensive contract does not put the overall project over budget. Any remaining toll revenue once construction and maintenance are paid for will go to providing alternative transit options like commuter buses and park-and-ride lots. VDOT Commissioner Charles Kilpatrick said the lack of experience with stand-alone electronic toll installation made cost projection difficult. “We don’t do a lot of these frankly … not a lot of data in our systems to say all right, ‘what do these things cost.’ And even nationwide, typically this kind of work is inside of a much bigger highway project. You don’t typically go in and put in these types of systems as a stand-alone project,” he said. Commonwealth Transportation Board Member William Fralin called it a warning. “We haven’t built a toll gantry in 30 years or more, and when we decided to take this project on internally … we can’t have double the cost estimates coming in on this or our revenue projections being wrong. So I think it’s just a cautionary tale about something we’re embarking on that we really haven’t done,” he said. The construction contract requires the installation of five toll gantries, shelters and high-tech sensors that a different company will use to manage toll prices and messaging. The contract also includes the installation of message signs that will tell single drivers the toll prices. Single drivers traveling toward D.C. in the morning and toward Fairfax County in the afternoon will pay a toll to use the lanes. The work is expected to begin by late summer with all construction completed no later than mid October 2017. The Commonwealth Transportation Board also awarded a $27.6 million contract Tuesday to TransCore to set up, operate and maintain the toll system inside the Beltway for five years. There also is an option to extend the deal for five more years for $11.6 million. Separately, Virginia is moving forward with plans to add an additional lane on I-66 eastbound between the Dulles Connector Road and Ballston. Outside the Beltway, Virginia is considering bids to design, build, operate and maintain two new express lanes in each direction all the way to Gainesville. 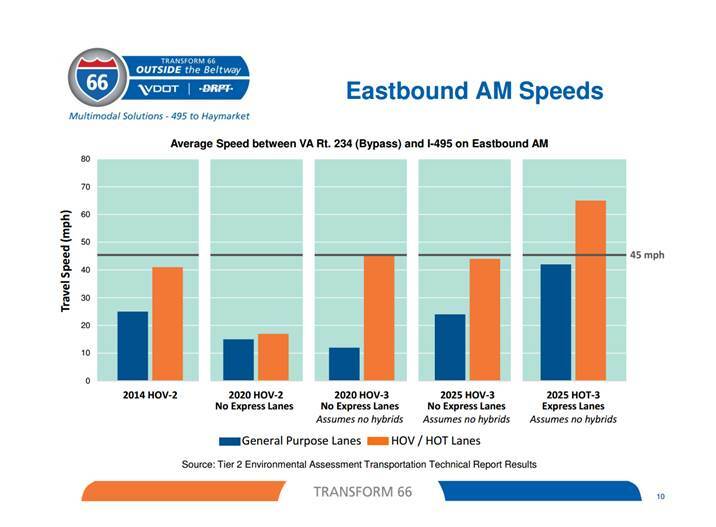 The express lane would replace the corridor’s existin HOV lane. The transportation board voted Tuesday to officially change the HOV rules when the toll lanes open as required under Virginia law. The change will require three people in the car to use the lanes for free, instead of the two occupants required to use the lanes today. VDOT Megaprojects Director Susan Shaw pointed to data showing that if the rules were changed to nudge more people to carpool, all drivers would benefit. “We have data to support that this action is in the public interest, that it is supported by quantitative and qualitative evidence that the HOV-3 designation will facilitate flow of traffic in the corridor both for the general purpose lanes as well as the express lanes. And then it also helps us comply with the Clean Air Act,” she said. In order to convert the lanes to express lanes like those on Interstate 95 and the Beltway, Virginia law requires a conversion from HOV-2 to HOV-3.